Lemon Drizzle Cake with Blueberries and Raspberries. A quick to make, simple recipe that harmoniously blends the complimentary flavours of lemon, blueberry and raspberry. As often happens at our house, something delicious happens when I try to make good use of things leftover from other recipes and this lemon drizzle cake is a perfect example. A couple of days earlier I had purchased some fresh raspberries and blueberries to garnish a dessert that I had made to photograph for my upcoming Christmas cookbook. Frozen Raspberries and/or blueberries can make this recipe more economical without sacrificing flavour. There was also a lone lemon in the fruit drawer of the fridge, the only remaining one from a large bag of them that we had purchased at Costco a couple of weeks earlier. I just wanted to use them all up, in something simple for dessert at dinner that night. “A quick snack cake”, I thought, being reminded of the Blueberry Snack Cake that I’ve made hundreds of times since I was a kid. Blueberries, raspberries and lemon all compliment each other so why not. I reduced the amount of milk in the batter just a little to help keep the berries from sinking to the bottom because they were a little larger than the smaller wild blueberries I normally use in the cake and that worked out quite well. Spouse declared it to be one of the best quick cakes ever to come out of our oven. Like this Lemon Drizzle Cake recipe? You can also sign up for our FREE newsletter to know immediately when we add new recipes are added. You’ll also get weekly suggestions for great family friendly meals and desserts too! Love great homemade cake recipes? 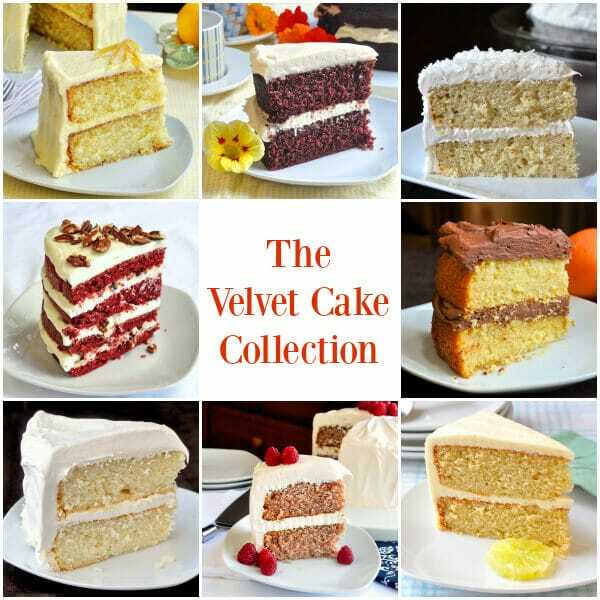 Check out our entire collection of Velvet Cake Recipes! Lemon Drizzle Cake with Blueberries and Raspberries - a quick to make, simple recipe that harmoniously blends the complimentary flavours of lemon, blueberry and raspberry. Preheat oven to 325 degrees F. Grease a 9x9 inch baking pan well. Add the dry ingredients alternately with the milk, beginning and ending with the dry ingredients. In general, I add the dry ingredients in 3 portions and the milk in 2 additions. Quickly and gently fold in the berries. Bake at 325 degrees F in a 9 inch well greased square pan for about 40 to 45 minutes or until a toothpick inserted in center comes out clean. The baking time can vary, especially if you use frozen berries. In that case it may take 10 or even 15 minutes more to bake. The toothpick test is the best way to ensure that this cake is fully baked. Whisk together the lemon juice, zest and icing sugar. If the drizzle seems too thick, add a little more lemon juice, it it is too watery add a little more of the icing sugar. You want it pourable, not spreadable but still a little thick. I like the lemon glaze separate from the vanilla cake flavour in this cake but if you want to make the cake with added lemon flavour as well, simple fold in the finely grated zest of about half a lemon along with the berries. What a delicious sounding flavor combination!! This looks like the perfect summer cake! I made this cake for my husband’s birthday. It was simply delicious! I didn’t have any raspberries so I substituted frozen strawberries and used frozen blueberries. We like lemon, so I added extra lemon in the glaze. I will definitely make this many times. This sounds & looks very good! I was wondering if the cake can stand on its own without the glaze & maybe with the lemon rind added to the cake batter. I think it might make a nice “breakfast” cake. I always serve a “coffee” cake, scones or muffins to my B&B guests while they wait for the main hot breakfast, but I think the glaze might be a bit too much. Can the drizzle be put on a couple of hours before serving the cake or is it best to put on right before serving? Thanks! I always do it beforehand and let it rest. Do you ice the cake in the pan or take it out first? 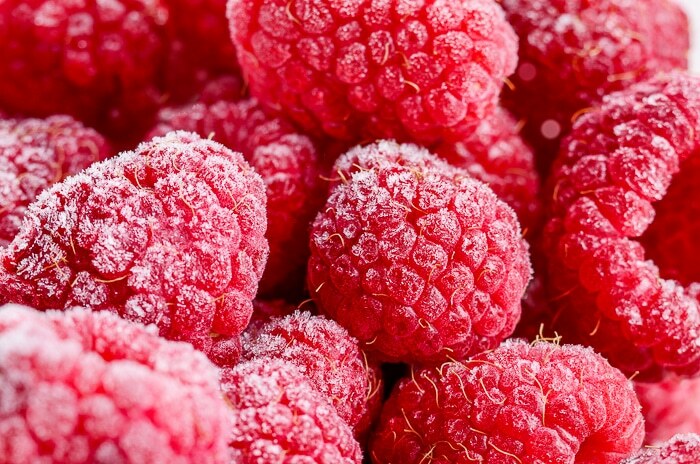 DO YOU HAVE TO USE FROZEN BERRIES? CAN I GET FRESH AND TOSS THEM IN FLOUR SO THEY WONT SINK? Read the ingredients list again. It clearly states you can use either. Also your caps lock is on! LOL!